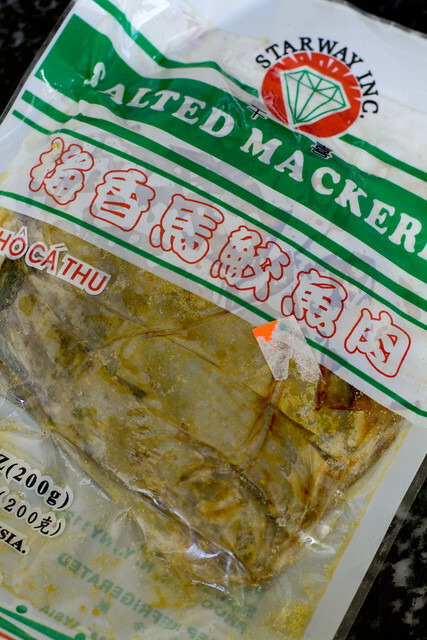 The hardest part of this recipe is finding the right Salted Mackerel. Many different kinds are sold in the Chinese supermarket so you’ll have to do a little trial and error to find which one you like more. Some like the fish that stay together in chunks. Some like the fish that crumble into the rice. This one crumbles…and they vary in level of aroma, which some may find stinky. 1. Day-old rice will stick together in one large mass. Break it up with a fork. Set aside. 2. 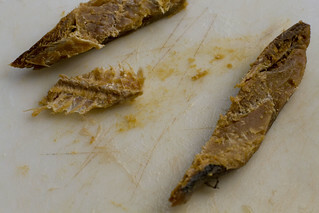 Split the mackerel and remove the bones. Dice into 1/3″ cubes. Set aside. 3. 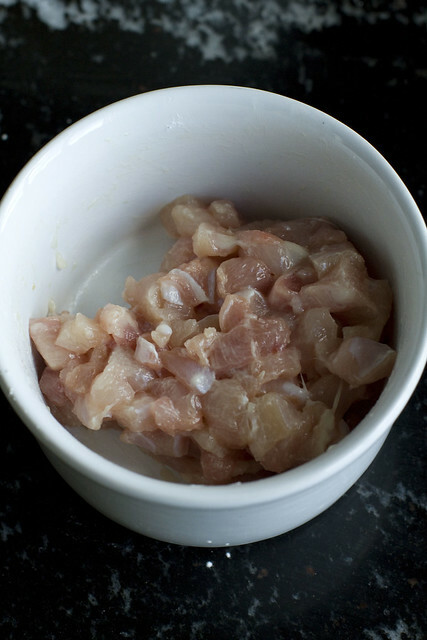 In a small bowl, stir together chicken, cornstarch, and salt. Set aside. 4. Beat 2 eggs in a small bowl and set aside. 5. Heat a large wok on high heat. 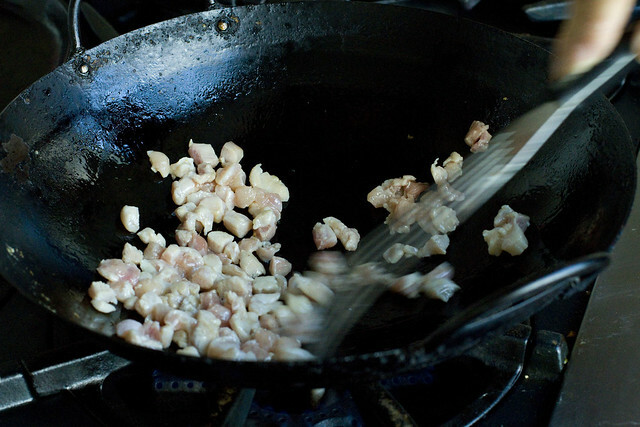 When you start to see smoke, add 1 tablespoon of oil and swirl it around the wok. 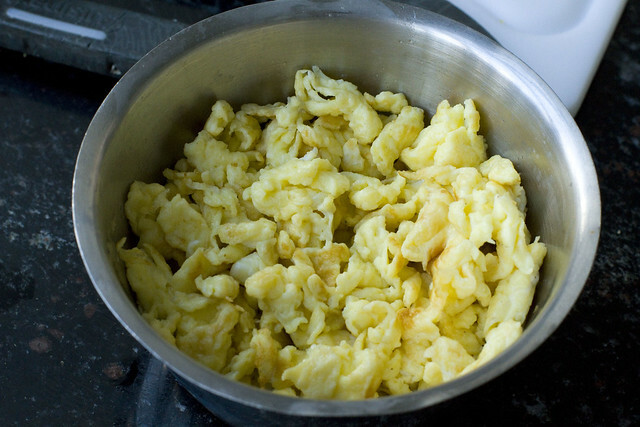 Add the beaten eggs and stir and flip rapidly as it cooks very rapidly. Break it up into pieces. Immediately remove to a bowl and set aside. 6. Bring the wok to a medium heat and add 1 teaspoon of oil. Swirl it around. Stir-fry the prepared chicken pieces until the pieces turn white. (The chicken will be partially cooked. ) Remove to a bowl and set aside. 7. Add 1 teaspoon of oil to the wok and swirl. Add half of the scallions and stir-fry them. 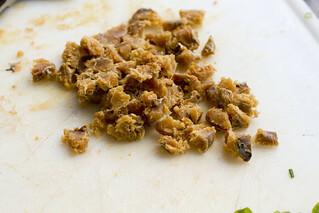 Add 2 teaspoons of oil, swirl, and add the diced mackerel. Toss and few times until well combined. 8. Add the other half of the scallions in. Add the rice and flip constantly while adding 2 pinches of salt. Add the partially cooked chicken and flip to combine. Add the cooked eggs and stir and flip for 2 minutes. Check for seasoning. 9. If the rice looks oily crack the last egg on top and stir/flip until well combined. The egg will soak up any extra oil. If it doesn’t look oily, you don’t need the 3rd egg. Serve. *This recipe is meant to be a side dish but you can adjust for a little more chicken if you want it to feel more substantial. posted by jessica	at 11:06 AM	Filed under Chinese, Recipes. You can follow any responses to this entry through the RSS 2.0 feed. Both comments and pings are currently closed. I could almost smell it. Just have to get salted fish. Thanks for sharing! 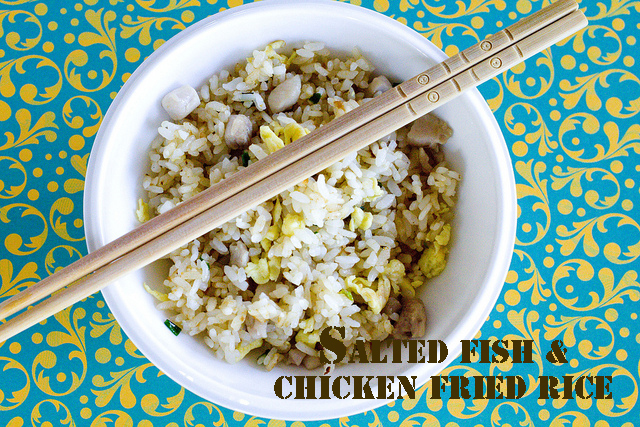 I’ve made a lot of fried rice before, but never had it with salt fish. Thanks; I must try! (I wonder if it would work with salt cod?) I break up my day-old rice by dampening my hands and rubbing the rice between them. A little messy, but works very well! P.S. Again, I can’t pin the picture at Pinterest. Offers a picture of a cup cake instead. Weird. Anna, that is the hardest part since it’s not available everywhere. Jessie, I think salt cod could taste pretty good in this. I imagine your method breaks up rice even better. Ugh, for the pinterest, I just don’t get it. I don’t understand why some of the pictures can be pinned and some can’t. =( I’m still working on it….thanks for trying! Is there a possibility that your pictures are on Flickr…and are set to Private? Looks amazing!!!! 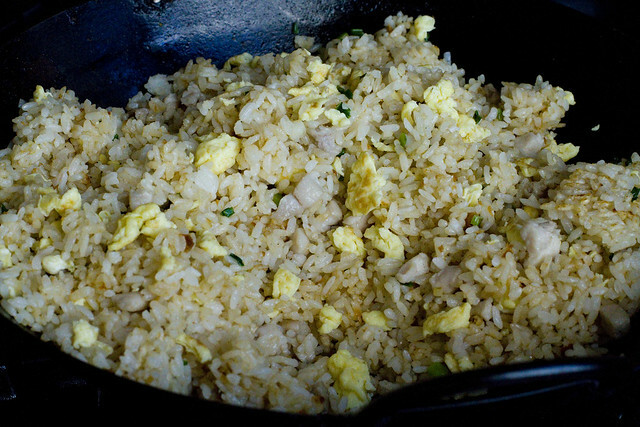 Nice to have a fried rice recipe without soy sauce. I am going to try it for sure. 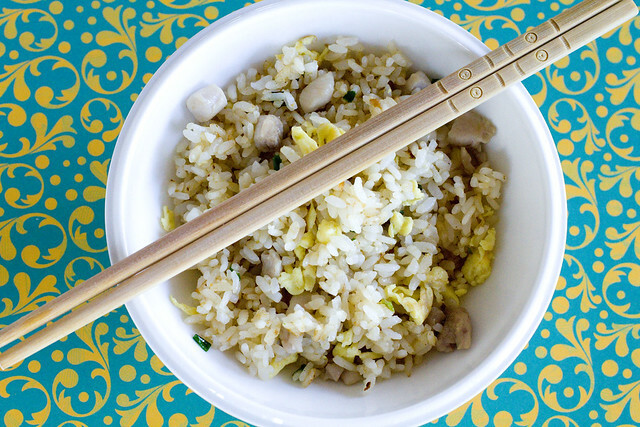 This recipe would go well with your Taiwanese Cucumber recipe, which I make often:). Nina, I’ll be waiting for your feedback on this fried rice. So happy that you enjoy the Taiwanese cucumbers!! Woohoo! One of the pictures — the one of the frying pan — will now pin. Pinned it is! And oh, I did make this with salt code and it was mighty tasty! Um, I meant salt COD, of course. Code is not tasty under and circumstances.